I hope you have taken note of the post title.As it suggests,this one is not going to be a full fledged review of the 'National Bestseller' (okay,I'm too lazy to write a really long review of the book-I admit! Besides,I think it's pointless to write a really long review for a book which has already been lapped up by the masses! ).So just scribbling down the few thoughts which came to mind after reading this supposedly supercool chick-lit work by one of the most read IAWE of modern times. (Indian author writing in English).With a virtually non-existent storyline(the whole novel is built on the premise that the presence of 'Zoya' is lucky for the 'Indian Cricket team),the book heavily relies on Anuja's 'Chetan Bhagat'ish writing style and witty one-liners to make it work.But frankly speaking,I didn't find Zoya's adventures that much amusing. The story goes like this- Zoya Solanki works in an advertising agency and is in charge of a soft drink brand which is curiously similar to 'Pepsi' She happens to be with the Indian Cricket team at Dhaka for the shoot of an ad film and suddenly people start believing that she is the 'reason' for the new found string of successes of the Indian Cricket team.The Indian Cricket Control Board doesn't want to take any chance and insists that Zoya accompany the team for the Cricket World Cup in Australia so that the presence of the lucky Zoya will ensure that Nikhil Khoda(the Captain) will lift the Cup. 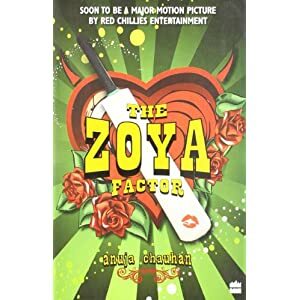 Anuja's writing style is aimed at the masses(but the length and price of her books are really not,I must say).There are numerous references to SRK,other Bollywood stars(for instance at one point of time,Chouhan compares Jagpal Lohia to BIG B in Sarkar),popular brands and Hindi movies.There is a romantic track,not very subtle mention of the F word frequently and most of the things which one usually associates with a desi chick-lit work(if you are a fan of this genre,there are high chances of you actually falling in love with this work!the genre cliche's are all there in place- the supercool,almost thirty/independent/slightly chubby faced protagonist , the handsome hunk who falls for the heroine's charms without any genuine reason;everything is there without fail).But the lack of a credible story line is pretty evident and added to that most of the gags and supposedly funny one-liners missed the mark(atleast for me). Bottomline- I didn't like this work that much.May be you can give it a try. (So many copies of the book have been sold by now.Afterall,so many people can't go wrong naa? ).I'm giving it a 2 out of 5.